BRONX (WABC) -- The girl who suffered major facial burns during a prank in the Bronx received a special honor Thursday. 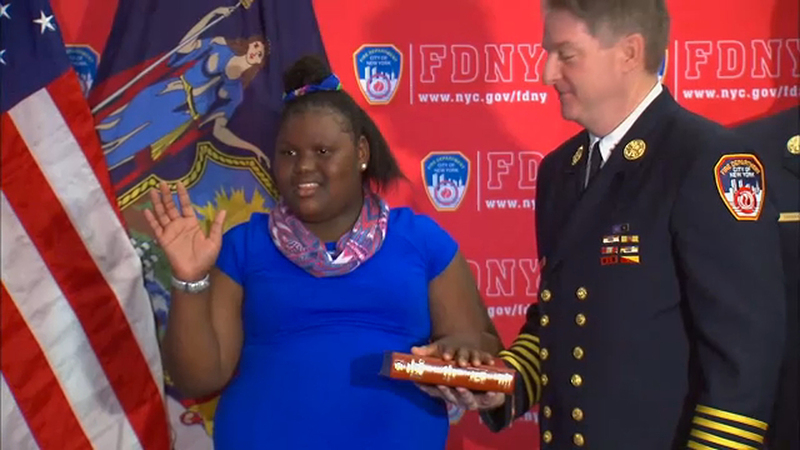 11-year-old Jamoneisha Merritt was sworn in as an honorary firefighter in Brooklyn by New York City Fire Commissioner Daniel Nigro. She will also spend the afternoon with members of New York's Bravest, and take a tour of the firehouse. In August, Jamoneisha was badly burned after a girl threw boiling water on her during a joke gone wrong at a sleepover on Findlay Avenue. She was burned over 85 percent of her face and spent 11 days in the hospital. During that time, members of the FDNY's black firefighters association visited her. That's when they learned Merritt wants to be a firefighter someday.